Dragon, schmagon. 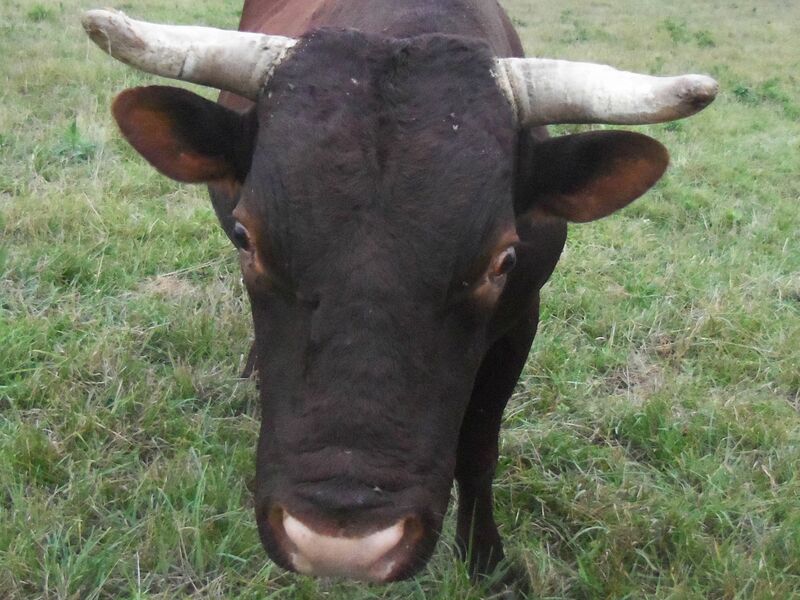 Around here, 2012 has been the year of the bull, I don’t care what that Chinese calendar says. Henry enjoyed his brief interlude with Mrs.Robinson Hannah, has graduated and gone forth to make his mark on the world. 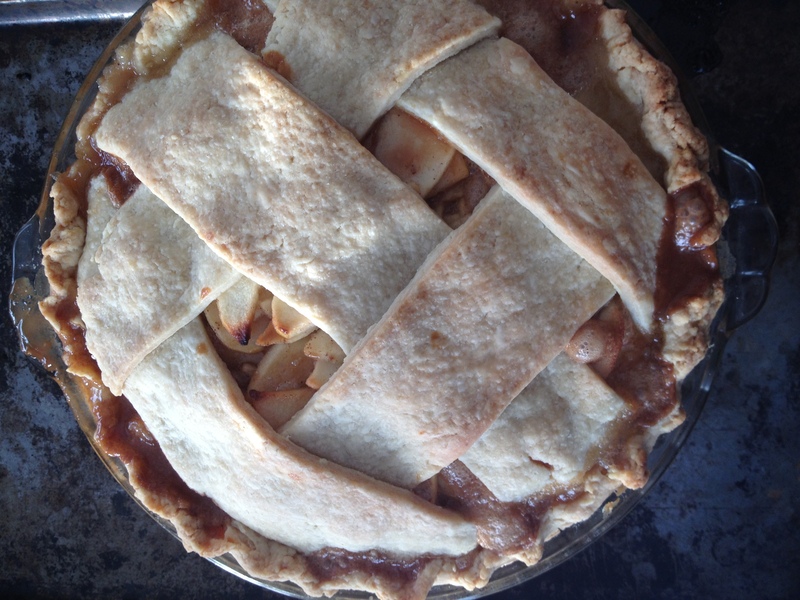 Hannah worked her magic and taught Henry about the pleasures of indoor living. 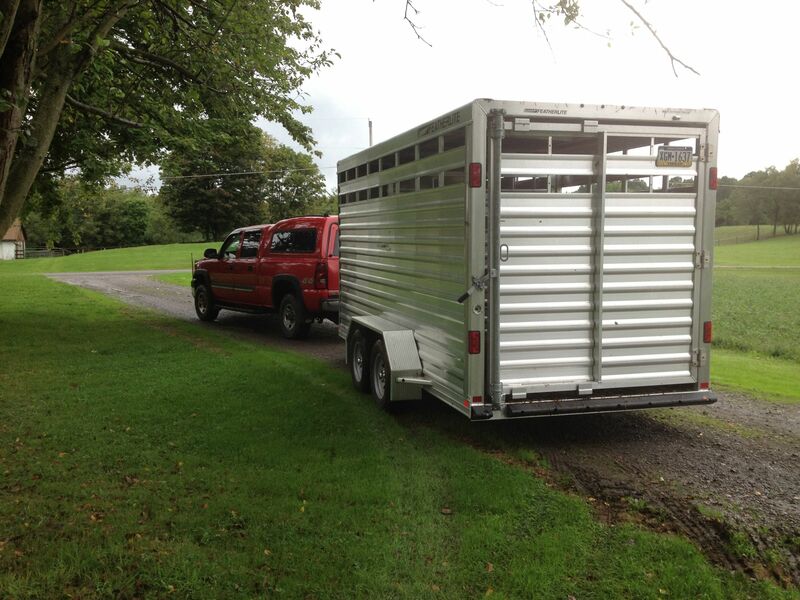 With Hannah’s help I was able to get Henry inspected by the veterinarian for interstate travel, get a tag in his ear and load him on the trailer. Henry took a long, rainy ride to his new home at Mount Pleasant Plantation in Virginia where he now lives with eight beautiful ladies on this fascinating restored historic property. It’s open to the public – check it out. I’m so happy to see Henry put to use as a breeding sire – he is so very handsome and his mother is one of the most beautiful Devon cows I’ve ever seen. Her robust self-sufficiency is exactly why Milking Devons are so deserving of preservation. Henry has much to contribute and it makes me happy for him to have the chance. Sadly because he was so closely related to all of my cows, he would not have had a chance to be a herd sire here. 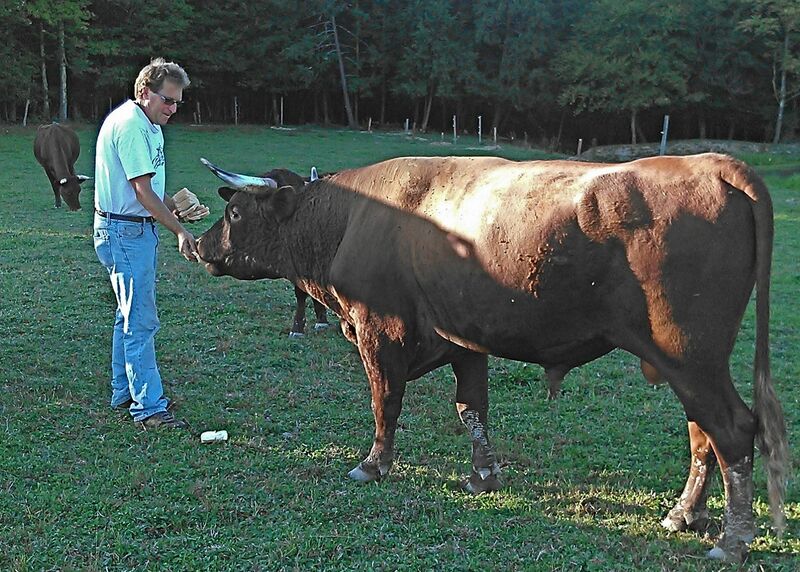 Max is Molly’s 2012 calf. Max had a little extra sparkle from the very start, so I left him a bull. Good Devon bulls can be hard to find, and one as nice as Max really needed to find a herd of his own to spread that sparkle around. 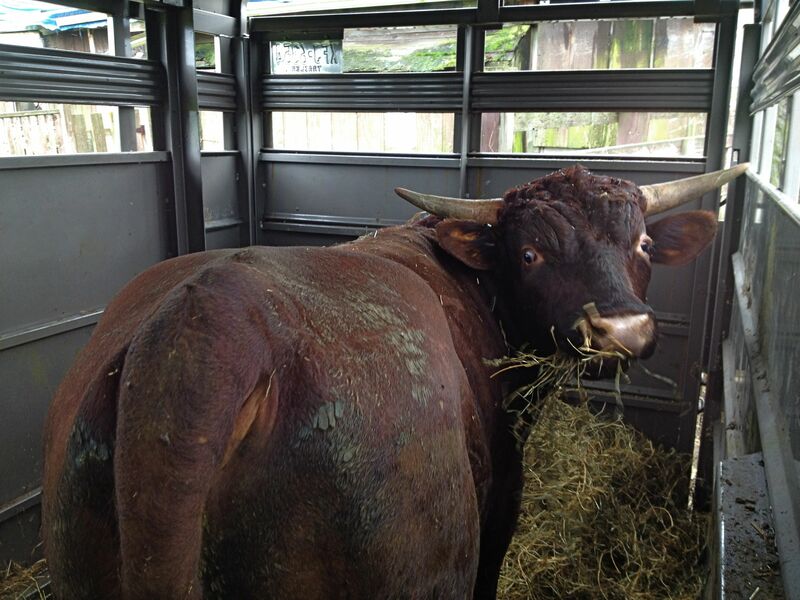 Max has gone to our friends at Ox Hill Devon Farm, where they specialize in training oxen. Apparently he wasted no time showing those future oxen who was boss which I suppose is how he earned his new name. I have no doubt that Max will father some impressive oxen and he is waiting rather impatiently for his chance. Max heads out to start his new life…. Rocco was the very first calf born here so he’s especially meaningful to me. He is personality packed and had the shiniest baby coat I’ve ever seen. I’m not kidding – I’ve never seen anything like it. He was immaculate and gleaming at all times. Rocco never had a gawky teenage moment – he was beautiful from day one. And, when he was a young bull calf, he never walked anywhere – he ran. I was more than a little grateful when he outgrew that since nothing makes your blood turn cold faster than a full-sized bull galloping towards you. He only wanted to say hello and see if you’d give him a treat or a scratch, but still…. Rocco has passed his sunny nature to the few calves he had here: Honey, Sammy, Rose, Henrietta and Sprocket, so Rocco is still very much present here. He’s doing well at his new home in Corning, New York with his new family, the Kehoes. From the looks of things, Rocco looks pretty pleased with his fortune and his new Ladies. Ellis and I have established a working relationship of sorts. He has decided to completely ignore me unless he has a complaint for management. Then he’s right in my face with his growls and grumbles. But wait. Is this old bull learning new tricks?? I’ve managed to deal with his destruction, not by teaching him to stop it, but by fencing him out of anything he can destroy. My watering system looks silly, but at least now it doesn’t take a ridiculous amount of time and two or three interruptions a day. Occasionally Ellis gives a bucket of water a toss, but since there are now ten 15 gallon buckets spread around instead of two big ones, smashing water buckets has lost most of its thrill. Recently, I’ve been worrying because mysteriously, my fence is not holding the stiff electrical charge it did. The cows are well-trained so rarely test it anymore, but still. That thin wire is all I’ve got keeping those cows in, so I’m not one to gamble with it. What’s going on here? There’s a boulder laying on the wire! And is that a message? What does it say? 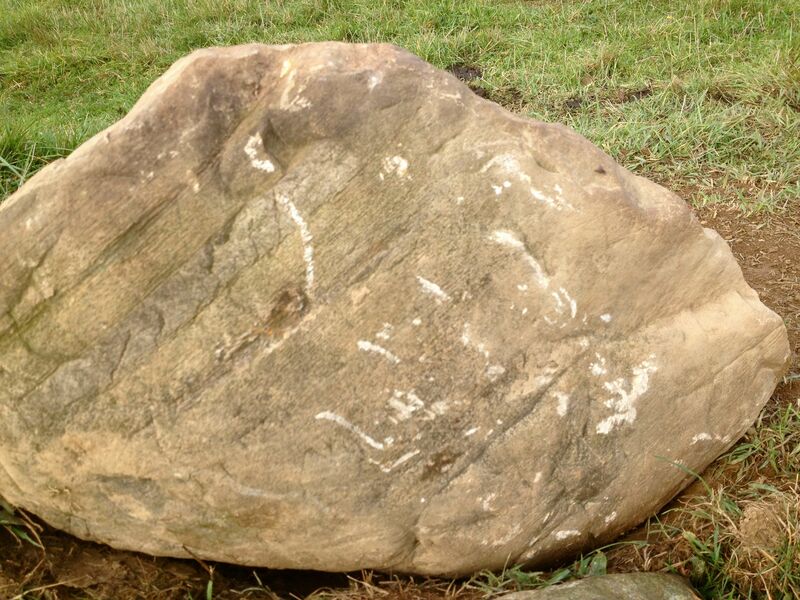 So glad to see Ellis has learned to toss boulders and use his horns to scratch out messages on trees, fence posts and rocks. And here I was worried because he didn’t have any hobbies. What does Ellis have to say? Well, your guess is as good as mine, but I’m pretty sure it’s not a gratitude journal. LOL! Having laughed at Ellis’ antics, I feel compelled to give you my 2 cents (and, of course you can do what you want with it). I wouldn’t keep a mean bull. I might even link “destructive” with “mean”, as I couldn’t be sure that I wouldn’t be the next boulder or water tank he’d feel like tossing. With that said, that’s the clearest cause of a fence “short” I’ve seen in a while. No question about it. I don’t disagree one bit Lona. Ellis is a very good quality bull, and while I would not say his character is “mean”, it’s definitely restless and edgy. 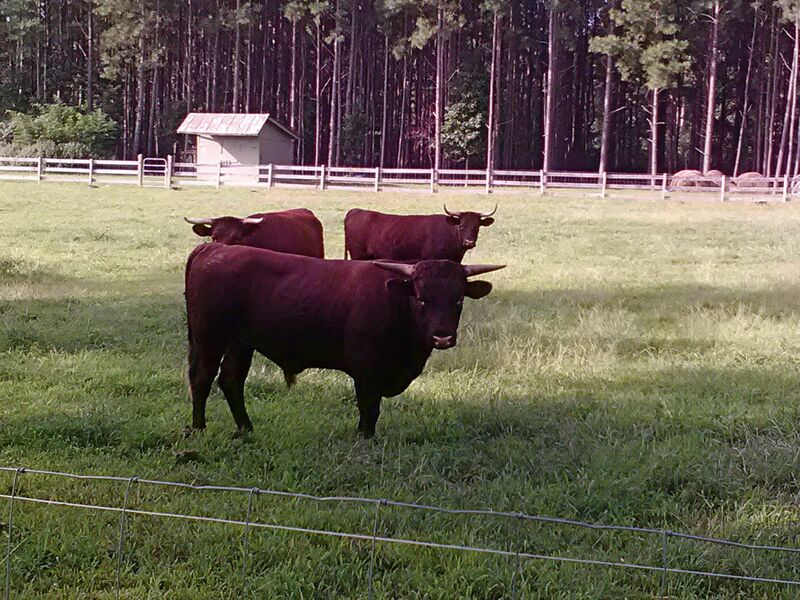 He’s bored with these cows and I believe will improve when he’s pastured with the steer. I am not concerned that he is passing bad character on to his calves, but I don’t enjoy having him around. Since it will be a greater inconvenience to replace him for next season than to suffer through, I’ve committed to doing my best with some caveats. 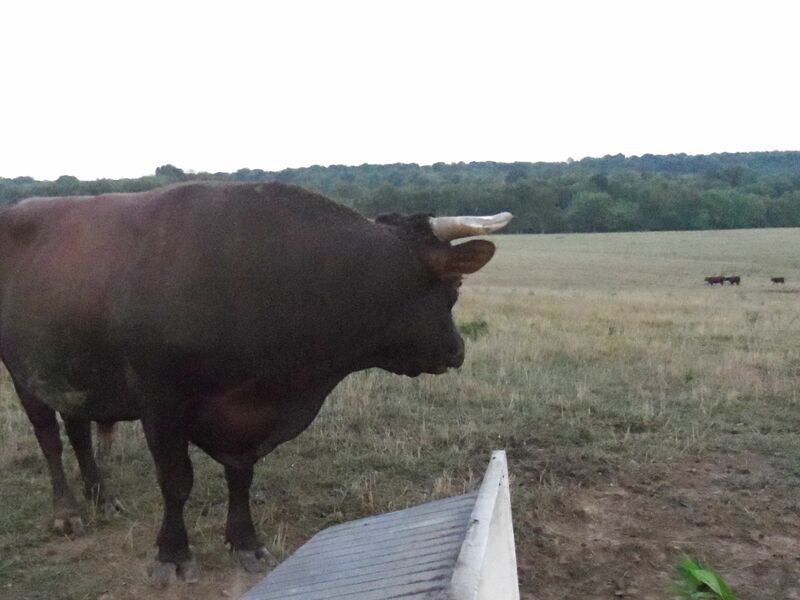 If he becomes aggressive or difficult to contain, he’s freezer beef, though the path from pasture to freezer is tricky one too… he’s not going to be easy to get out of here. That Max looks like a muscular fellow – he looks great. I do like the short hair on your herd, it would be very useful where we are. But a rock throwing bull is something new to me. 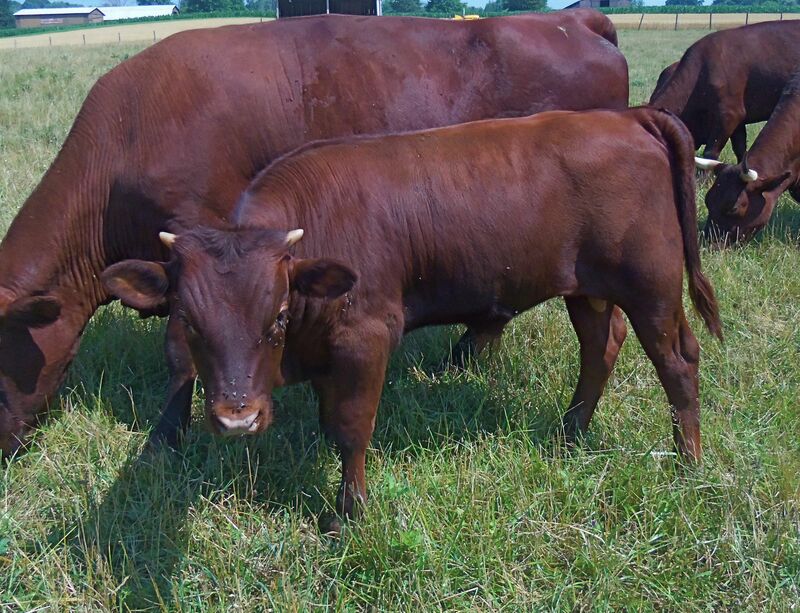 Your plan to raise young bulls on the farm rather than buying mature bulls seems a smart move. Max is a beefer. Very handsome, may be the best I’ve bred yet. Of course, his mother is a pretty exceptional cow.